Pedigree with familial C3 glomerulopathy. Affected individuals indicate those with C3 glomerulopathy confirmed on renal biopsy. Probable affected indicates those with significant proteinuria (>300 mg/24 h or at least 3+ on urinalysis) or hematuria (at least 3+ on two occasions). Unaffected individuals are healthy and do not have abnormal urinalysis. The CFHR3–1 hybrid gene structure, genomic breakpoint, and protein. (A) Schematic representation of the CFHR3–1 hybrid gene and protein. Red arrows indicate sites of probes giving three copy signals, whereas blue arrows depict probes giving two copy signals using copy number assays. Exons and protein domains are numbered. The intergenic distance between CFHR3 and CFHR1 is 24 kb. 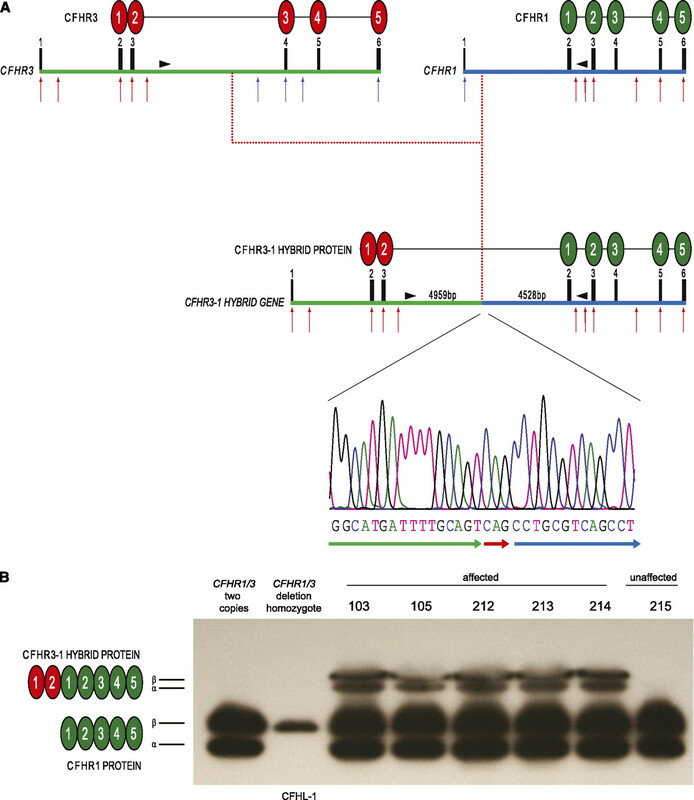 The genomic breakpoint (4959 bp into CFHR3 intron 3) was identified using paired-end mapping analysis of next-generation sequence and long-range genomic PCR and amplicon sequencing. The breakpoint sequence contained a CAG triplet not identified in the introns of either gene (red arrow). (B) Serum Western blot using polyclonal anti-CFH antibody demonstrated the presence of two additional protein bands of similar molecular mass only in sera from affected individuals. The two bands represent differentially glycosylated isoforms (designated α and β) comparable with that seen with CFHR1. CFHL-1, CFH-like protein 1, a protein derived from alternative splicing of the CFH gene that is visible on this gel only in the absence of CFHR1 protein (lane 2). MPGN, membranoproliferative GN; NA, not assessed. NHP, normal human pool; C3NeF, C3 nephritic factor; AEU, arbitrary ELISA units; CFI, complement factor I; ND, not detected. ↵a No validated reference range exists for CFH and CFI and results are thus expressed as the percentage of NHP. C3NeF was detected using a commercial assay (The Binding Site, UK).